Looking back when you first designed your site, what would you have done then to plan for today, knowing websites are revenue-generating tools and not just a necessary business evil? Today, your brand’s first impression may partly be due to your website but the buying decision of your audience is aggregated almost exclusively on your website… if agreed, taking the necessary steps to redesign your site, to be a lead-generating tool, isn’t a task to be taken lightly. Certainly, it requires a fair deal of thought, time and a reasonable budget, but the upside is revenue! The alternative becomes a necessary marketing evil and so we ask… why have a website to begin with? We’d love to hear your rationale! NOTE: We aren’t advocating a complete overhaul of your web pages and the look and feel of your site. The goal here is to reevaluate the impact of your website and make some functional modifications so that it helps drive your marketing funnel and sales pipeline. 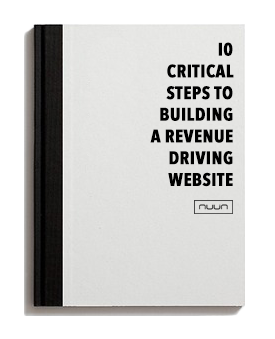 Because many of us marketers and executives are familiar with many pragmatic reasons not to redesign your site, here are ten strong reasons we argue are critical to building any revenue-accountable website. Use the form to the right to download our PDF.